Note: Initial commercial scale facilities are expected to produce between 10 and 30 million gallons of biofuel. As yields improve and producers take advantage of economies of scale, this could grow to 50 or 100 million gallons. Several companies combined to produce about 20,000 gallons of fuels using cellulosic biomass (e.g., wood waste, sugarcane bagasse) from commercial-scale facilities in late 2012. EIA estimates this output could grow to more than 5 million gallons in 2013, as operations ramp up at several plants. 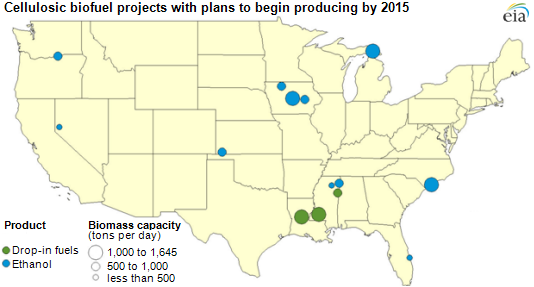 Additionally, several more plants with proposed aggregate nameplate capacity of around 250 million gallons could begin production by 2015 (see map). Although cellulosic biofuels volumes are expected to grow significantly relative to current levels, they will likely remain well below the targets envisioned in the Energy Independence and Security Act of 2007. That law set a target level of 500 million gallons of cellulosic biofuels for 2012 and 1 billion gallons for 2013, growing to 16 billion gallons by 2022. The projects identified on the map above were designed to produce ethanol or drop-in biofuels (i.e., fuels that are direct replacements for petroleum-based gasoline or distillate fuels) as well as steam. Using technology known as combined heat and power, this steam can both be consumed internally as a process-heat source and used to generate power. The power can also be used internally to operate pumps and other electrical equipment or sold to the electrical grid, giving these projects the potential to consume no fossil fuels. A number of the projects shown on the map may also generate a solid co-product with the potential for use as a fertilizer. To the extent that feedstock for these processes are waste products and little-to-no fossil inputs are required for their conversion, greenhouse gas emissions could be as much as 80% to 90% below those of petroleum products on a life-cycle basis. All EIA forecasts and projections made since the passage of the Energy Independence and Security Act of 2007 anticipated large shortfalls between the renewable fuel standards (RFS) targets and the volumes of cellulosic biofuels sold. Despite this, EIA's forecasts and projections to date have proven to be too optimistic, as volumes have been below expectations. Looking forward, important challenges remain for cellulosic biofuel production. Total production costs for many of these first-of-a-kind projects remain higher than the cost of petroleum-based fuels on both a volumetric and energy-content basis. Cellulosic ethanol also faces the same market and regulatory challenges to increasing its share of the fuel market that is faced by other types of ethanol. While liquid fuels and electricity are expected to be the primary products of this industry in the near term, many companies are developing technologies to produce intermediate chemicals from cellulosic biomass as well, including butanediol, polymers, succinic acid, paraxylene, and others. Over the medium to long term, these technologies have the potential to improve business cases for producers by increasing margins and diversifying revenue sources.